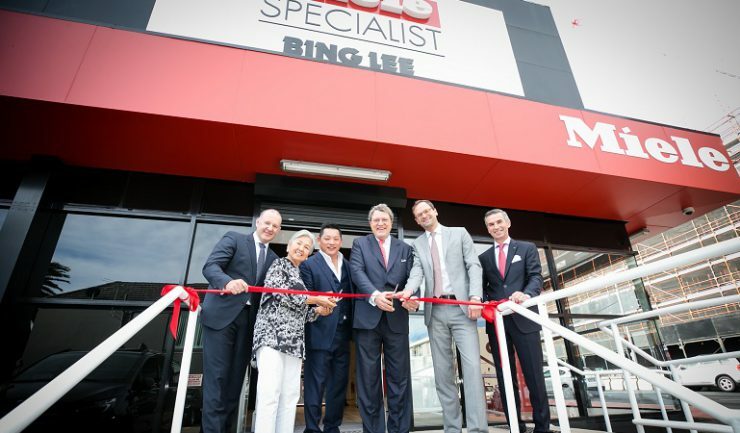 Bing Lee recently held an intimate official opening event for its Miele Specialist store in Drummoyne in Sydney’s inner west suburbs. Miele executive directors, Dr Zinkann and Dr Kniehl, Miele Australia managing director, Sjaak Brouwer, Narta CEO, Michael Jackson and non-executive chairman, Kay Spencer, were among the attendees. Speaking at the event, Bing Lee CEO, Lionel Lee said, “On behalf of our family, it is very humbling to stand here in this showroom. We started trading Miele around eight years ago due to Kay Spencer’s relentless pushing of Miele management at the time so our first thank you as a family is to Narta and to Kay. Thank you for believing in us and backing us. “To the Bing Lee team, who have laboured long and hard, it took a while but we got there. Thank you for your doggedness to make the store amazing. I would also like to thank John Murphy for his efforts with this project; he is back ‘home’ now and we are very happy for him. L to R: Christian Gerwens (Miele), Yenda Lee (Bing Lee), Lionel Lee (Bing Lee), Dr Reinhard Zinkann (Miele), Dr Axel Kniehl (Miele) and Sjaak Brouwer (Miele). “Thank you to all of the Miele team and to Dr Axel Kniehl who walked in the door about three years ago and was very forthright in his opinion on our store. We have all come together and made this the showroom it is today.